Sappho has a nice cottage in Wales and she spends most of her time writing, which is a profession that makes her happy. She has a successful career as a fantasy writer. Sappho also has good friends and she doesn't think there's anything missing in her life. This changes when she realizes she has just one year left before she'll be forty years old. If she wants to have a baby she has to find a man as soon as she can. Meanwhile she's helping her friend Miranda to make sense of her difficult marriage. Men are complicated, which is why Sappho isn't interested in them. She's much happier on her own, only there will be no baby without the help of a man. 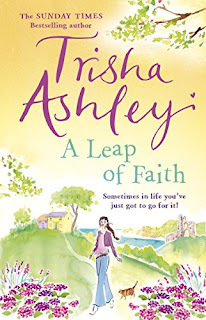 A Leap of Faith is a wonderful story with plenty of romance, compelling mysteries and countryside gossip and schemes. I loved this book from the first sentence. Sappho has a great, original voice. She's tough, she can be fabulously sarcastic and she is honest and loyal. I love strong women in books and really enjoyed reading about her. She's a good friend and does everything she can to help the people she loves. I liked how Trisha Ashley weaves Sappho's thoughts into the dialogue. This way the reader can see exactly what she thinks and how she feels, which is insightful and funny at the same time. Sappho has quite an active social life, so fortunately there are many things she can comment on. The personalities of the other main characters are all different and fascinating and I enjoyed seeing them through Sappho's eyes. I love Trisha Ashley's writing style. The text enhances the individuality of her characters. I often felt I could look into their minds and that makes this books so special. The story is fast-paced and every chosen direction makes sense and surprises at the same time. Trisha Ashley always manages to find the exact right tone of voice. She combines that with vivid descriptions of the countryside and all the dreamy professions of her characters are amazing to read about as well. While I often had to laugh when I was reading A Leap of Faith, I was impressed by the more serious side of this book too. Trisha Ashley writes about difficult topics with compassion and warmth. A Leap of Faith has a riveting ending. There are a few mysterious disappearances that made me really curious and I liked the finale very much. The unexpected twists and turns kept me on the edge of my seat, which is something that always makes me happy. I'm glad this fantastic book has been republished, it's a heartwarming story that deserves to be read by as many romantic readers as possible. Well if I wasn't ensnared by the cover (which I was), I'm over the moon for the description/review. Sound like a great addition to my wish list with things I equally enjoy. Thanks Suze! I appreciate the review on A Leap of Faith. I am looking at reading this great book very shortly. I love reading romantic comedies. Such a great review! Sorry, this just doesn't do it for me at all! But Vive La Difference and all that! Sappho, you say? Hmmm. Bless my poor little heart, I polished off an undergrad degree in a Liberal Arts sort of program. (Women's Studies minor.) I'd be curious as to how this character's name/sake might play out throughout the story, for surely the author didn't simply pull the name out of a hat. Similar to Kate's comment above, this book doesn't seem like my cup of tea-- it's chiefly in the storyline. The main draw (and it is a very compelling draw!) for me is the author's style of writing, as highlighted in this review. So I've currently got the author's Amazon page open in another tab, and I see that she has published several other books. Perhaps I will be doing a little perusing! I've been meaning to read Trisha's books for a very long time. This sound like it's really good. I didn't know it was republished, but if it's that good, then I'm glad it was. This sounds like such a good read. Sappho sounds like my kind of character. Great review!